Captain Lorca: Starfleet didn’t start this war. Harry Mudd: Of course you did. The moment you decided to boldly go where no one had gone before. What did you think would happen when you bumped into someone who didn’t want you in their front yard? Chloe: I’m not worried about Maze. I’m worried about Canada. Maze: I’m great at dismembering humans. How hard can it be to fix one? Marcos: That’s alright. You did something stupid for someone you love. Can’t say I haven’t done the same. Iris: I was engaged to somebody else. Barry: He’s actually dead, too. Therapist: Oh, you two have had to deal with a lot of trauma. Iris: We’ve been to a few funerals. Cisco: (to himself) You just had to fall for the girl in head-to-toe black leather, didn’t you? Yvette: The universe doesn’t care about happy endings. Kevin: Yeah, well, I do. Eleanor: Would someone’s foot really fly off their body like that? That was kinda cool…ethically speaking. Eleanor: I’m your hottest friend! No, Tahani. I’m your nicest… No, Jason. I’m your friend! Curtis: If one of us spots Tarkov, we should have a signal. Curtis: It’s not terribly original, but effective. Jack: You are exactly who you’re supposed to be. The previous episode “The Battle of the Bastards” was also fantastic, but this is my favorite because everything starts to come together in the season finale. Cersei refuses to stand trial, and instead blows up the High Sparrow, the Faith Militant, and most of the Tyrell family. Tommen then kills himself, and Cersei takes the Iron Throne. Aria exacts vengeance on House Frey for the Red Wedding. Bran has become the Three-Eyed Raven and learns that Jon Snow is the son of Lyanna Stark and Rhaegar Targaryen. Jon and Sansa have reclaimed Winterfell for the Starks, and Jon is named the King of the North by the rest of the Northern families, with a little help from Lyanna Mormont. 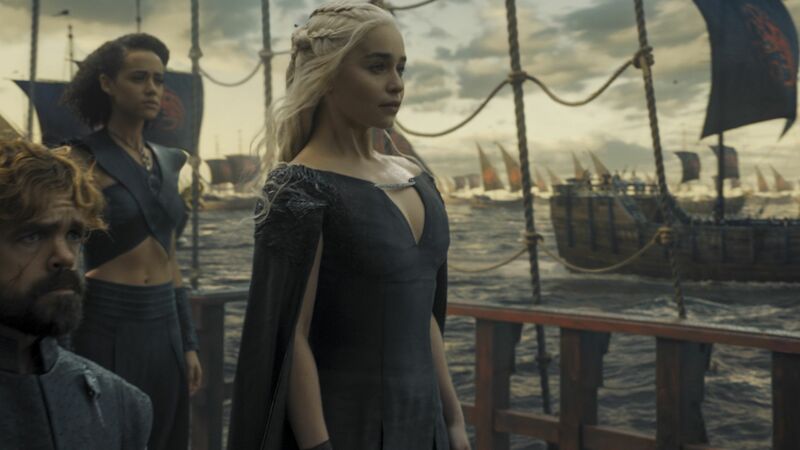 Daenerys makes Tyrion the Hand of the Queen and begins sailing across the Summer Sea with her dragons and her army, aligned with Dorne, Highgarden, and House Greyjoy. Everything seems to have fallen into place, and it set-up what will hopefully be a eventful season seven. I cannot wait to see what happens next. I had not read a lot about the show before starting to watch, and have never read Treasure Island, so I actually did not know that the show is a prequel to the book until the end of the most recent season. I mostly just like pirates and decided to finally catch up on the whole series this year. In this season finale, there is an epic battle between Flint’s and Rackham’s crews, the Maroons and the British. After the British are handily defeated, with help from Blackbeard, the pirate captains sit down together and begin to figure out a plan to take back Nassau. Meanwhile, Billy Bones and a few select others have been instilling fear in the people of the island, and Silver is finally given the name ‘Long John Silver.’ Lines have been drawn in Nassau, and if you are not with the pirates, you are against them. For me, this is the best science fiction show on television right now. Every season I think they cannot possibly blow my mind any more, and then they do, over and over again throughout the season. Cole and Cassie are stuck together in 1958, with no way back to the future unless they stop the primary from causing another paradox. When they fail, they FINALLY admit to each other that they are both in love, and they face those feelings head on. Back in 2044, everyone else is searching for Titan so that they can kill The Witness. This is not the season finale, but it ends in such a way that you have no idea how they could possibly go on from here, and yet they do somehow, and it is excellent. This show makes me laugh a lot. This episode in particular made me cry with laughter. The reason this episode has made my list is because of one specific scene where Angus has eaten hallucinogenic mushrooms and somehow manages to get into the freezer at a grocery store. He is enjoying the cold temperature, and tells Dylan that it’s like being in Narnia. When the grocery store employee tells him to get out, he tries to hide by putting a bag of frozen peas over his face. Later, after Dylan’s car gets a flat tire, Angus is afraid that they are being watched so he runs into the woods and climbs a tree. I chuckle just thinking about it. J‘onn: People in this world don’t have much tolerance for others who look different. I say that as an alien, and as someone who’s worn the face of a black man for fifteen years. Lucifer: Welcome to Devil Time. Chloe: What are you doing? Lucifer: Trying out my new catch phrase. Dan: “Welcome to Devil Time”? What the hell does that mean? Lucifer: She knows what it means. Jamie: I have no idea what that means. Chloe: A couple days ago, I was in a really bad car accident. And I’ve spent the last few days trying to convince everybody that cares about me that it wasn’t a big deal. The truth is, I’m terrified. I’m scared of how it can all just end, with no rhyme or reason. And what I want to do right now is just go home and read a bedtime story to my daughter. But, you know, that’s not up to me either. We can’t control what happens to us, only how it affects us and the choices we make. Ian Fleming: Rufus, there are allies, contacts, and women, but never trust. Only the mission. Hayes: Honestly, Dan, I hope your audience sees through this charade, because this here – Me in these pearls and this stupid suit – this is what privilege looks like. Dan: Can you elaborate on that? Hayes: The fact that you’re here talking to me – this is the problem. Rich, famous, powerful people get away with murder all the time, sometimes literally. Coke in the purse, insider trading, sexual assault – you name it. I screw up. Because of my last name, the cops call the DA. He calls my mom. Strings are pulled. I’m out on the street in an hour with a new job – a job I initially had no interest in. Funny thing is, I like causing trouble, busting the system, exposing wrongful convictions. Kind of gets me off. So, really, it worked for me, again. Now, hopefully, it’s also a bonus to people like Penny Price – a mom accused of killing her own son – to have me on their side. Because I may be a hot mess, but I’m a hot mess with privilege. And since Penny Price has none, the least I can do is lend her some of mine. Senator Marino: It seems to me that more and more we’ve come to expect less and less from each other. Diggle: You broke me out of prison. Lyla: For better or worse, Johnny. Diggle: I told you I wanted to stay. Lyla: And I figured, if you wanted to make your own decisions then you wouldn’t have gotten married. Evelyn: Things have really fallen apart without Oliver. Oliver: It’s a good thing I’m back then. Rory: Was he waiting for an entrance line? Curtis: No. He’s just that cool. Last week, I shared the returning shows that I am most excited about, so here are the eight new shows that I will be checking out this Fall. Please let me know in the comments which new shows you are looking forward to watching! 1. Queen Sugar, premieres September 6th at 10/9c on OWN, stars Rutina Wesley, Dawn-Lyen Gardner, Kofi Siriboe, Nicholas L. Ashe, Dondre T. Whitfield, Omar J. Dorsey, Timon Kyle Durrett, Greg Vaughan, Tina Lifford, Ethan Hutchison, Henry G. Sanders, Bianca Lawson, Glynn Turman, and Marycarmen Lopez. Based on the book by Natalie Baszile, and Executive Produced by Ava DuVernay and Oprah Winfrey, this show tells the story of estranged siblings coming together to run their family’s struggling sugarcane farm in Louisiana. The story itself sounds interesting, and the cast looks fantastic, but I am also interested in this series because DuVernay hired all female directors and she made sure that the crew was inclusive of all races and genders, which is, sadly, still very rare. 2. The Good Place, premieres September 19th at 10/9c on NBC, stars Kristen Bell, Ted Danson, William Jackson Harper, Jameela Jamil, D’Arcy Carden, and Manny Jacinto. Bell plays a woman who has entered into the afterlife and ended up in the Good Place, but soon realizes that she has been mistaken for someone else. So that she does not get found out and sent to the Bad Place, she is determined to change her ways and become a good person. Veronica Mars and Sam Malone together in one show?! I’m in. Also, it looks forking hilarious. 3. This Is Us, premieres September 20th at 10/9c on NBC, stars Sterling K. Brown, Justin Hartley, Ron Cephas Jones, Chrissy Metz, Mandy Moore, Chris Sullivan, Milo Ventimiglia, and Susan Kelechi Watson. This series will follow a group of people whose lives intersect and who all share the same birthday. In fact, they may have more in common than they think. It has a great cast, and looks like it will fill the Parenthood sized hole in my heart. Me and my box of tissues are ready! 4. Pitch, premieres September 22nd at 9/8c on Fox, stars Kylie Bunbury, Mark-Paul Gosselaar, Ali Larter, Mark Consuelos, Dan Lauria, Mo McRae, Meagan Holder, and Tim Jo. Bunbury plays a pitcher, known for her screwball, who becomes the first woman to play Major League Baseball. Even though she has made it to the big leagues, she still has to prove herself to her teammates and the fans. Fox has teamed with MLB for the show allowing production to film at Petco Park in San Diego, as well as the use of various MLB marks, logos, uniforms, teams, stadiums, and game footage. I was fortunate to see the first episode of this at a Round Rock Express game last month, and it is fantastic. I will say, as a Philadelphia Phillies fan, I am hoping for at least one cameo from the greatest mascot of all time.